In this tutorial, we'll learn how layers and layer blend modes in Photoshop make it easy to add a lens flare effect to an image without making any permanent changes to the original photo! We'll start by learning how to add lens flare, and position it exactly where we need it, using Photoshop's Lens Flare filter. Then, to keep things non-destructive, we'll undo the effect, add a new layer, and then instantly re-apply the Lens Flare filter using a handy shortcut! 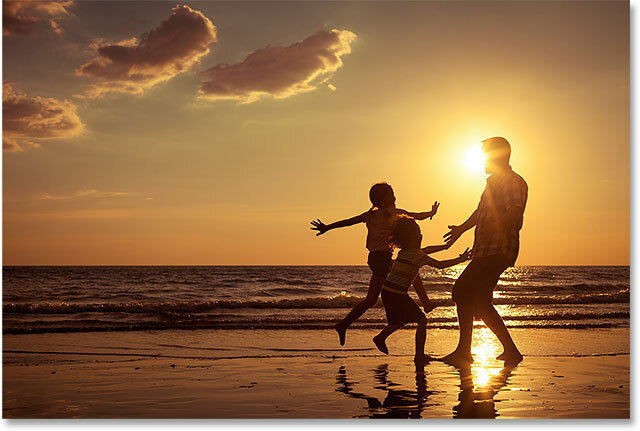 Finally, we’ll use the power of layer blend modes to easily blend the lens flare into the image, and finish off by adjusting its colors to better match the colors in the photo. We’ll also apply some blurring to soften the lens flare and help it look more realistic. 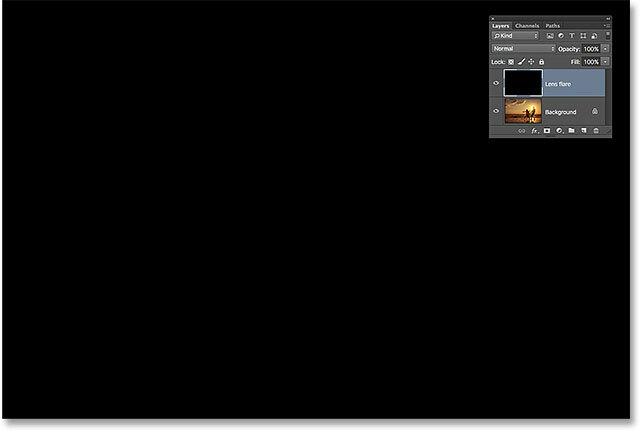 I'll be using Photoshop CC but this tutorial is also fully compatible with Photoshop CS6. For earlier versions of Photoshop, check out our original Non-Destructive Lens Flare Effect tutorial. Watch the video and share your thoughts on our YouTube channel! This opens the Lens Flare dialog box. 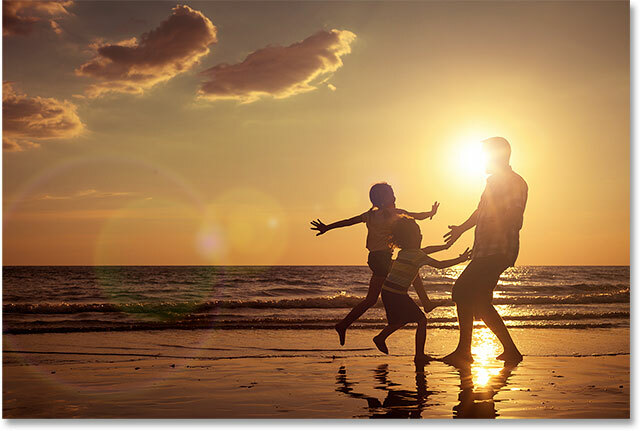 Photoshop's Lens Flare filter adds a simulated lens flare effect to the image, and we can choose from one of four different types of lenses (50-300 mm Zoom, 35mm Prime, 105mm Prime, and Movie Prime) in the Lens Type section in the lower left. Each one will give the effect a different look. You can try them out by selecting them and seeing what each one looks like in the image preview area. I'm going to stick with the default 50-300mm Zoom lens. You can also adjust the brightness of the lens flare by dragging the Brightness slider left or right, but again, I'll stick with the default 100%. Positioning the center of the flare over the light source in the photo. The image after applying the Lens Flare filter. The only problem is that we've applied the lens flare directly to the image itself, and that makes it a destructive edit because we've made permanent changes to the original photo. It's much better to work non-destructively whenever possible, keeping the image and the effect separate from each other. 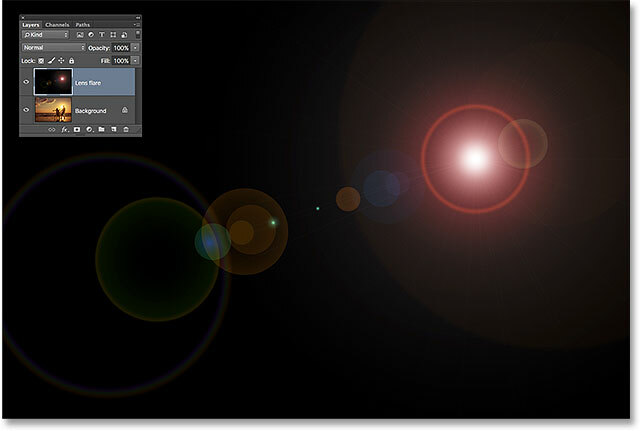 Let's see how we can apply the lens flare non-destructively by taking advantage of Photoshop's layer blend modes. Going to Edit > Undo Lens Flare. Clicking the New Layer icon while pressing Alt (Win) / Option (Mac). Naming the new layer in the New Layer dialog box. The new "Lens flare" layer appears. The document after filling the "Lens flare" layer with black. Now that the layer is no longer blank, we can re-apply our Lens Flare filter. Photoshop remembers all of the settings we used for the filter the last time we applied it, including the flare's position, so all we need to do is re-apply it using those exact same settings, and Photoshop gives us a couple of shortcuts we can use to do that. 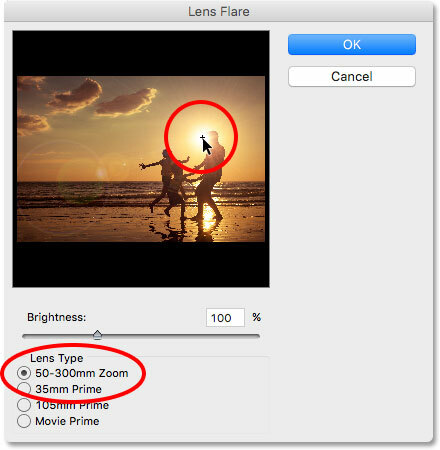 Selecting Lens Flare at the top of the Filter menu. The lens flare has been re-added but on its own layer. Changing the blend mode of the "Lens Flare" layer to Screen. The Screen blend mode hides the black and keeps the lens flare. Going to Image > Adjustments > Hue/Saturation. Dragging the Hue slider to change the colors in the lens flare. The result after shifting the colors in the flare. 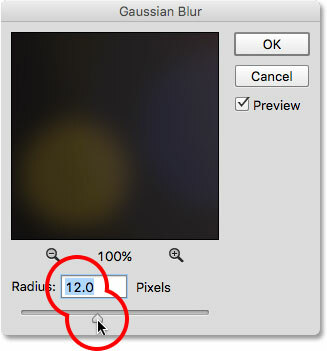 Dragging the Radius slider in the Gaussian Blur dialog box. The effect after blurring the lens flare. Lowering the opacity of the "Lens flare" layer. The effect after lowering the lens flare opacity. Setting Opacity back to 100%. 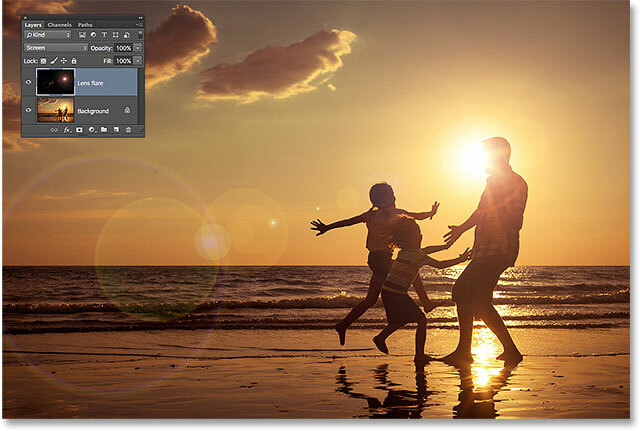 The Layers panel showing the new "Lens flare copy" layer. The lens flare is now twice as bright as it was before. Lowering the opacity of the "Lens flare copy" layer. And there we have it! That’s how to easily add lens flare to an image without harming the original photo using a combination of the Lens Flare filter and the non-destructive power of layers and layer blend modes in Photoshop! Check out our Photo Effects section for more Photoshop effects tutorials!